Sirius is the brightest star in the night sky. It is a binary star system in Canis Major, near Orion. It has an apparent magnitude of −1.46. The system is between 200 and 300 million years old. It was originally composed of two bright bluish stars. Sirius appears bright because of its intrinsic luminosity and its position (it is relatively close to Earth). At a distance of 2.6 parsecs (8.6 ly), the Sirius system is one of Earth's near neighbours. The Egyptians called this star 'Sopdet'. They relied on it to predict when the flood season would start. 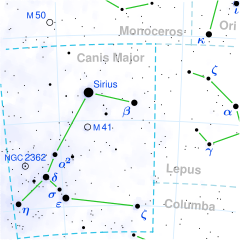 Sirius is sometimes called the Dog Star. The phrase the dog days of summer means the hottest days of summer. Sirius A is about twice as massive as the Sun and has an absolute magnitude of 1.42. It is 25 times more luminous than the Sun, but has a significantly lower luminosity than other bright stars such as Canopus or Rigel. Originally, Sirius B had about five times the mass of the Sun. and was a B-type star (roughly B4–5) when it still was on the main sequence. Sirius B used up its resources and became a red giant. Then it shed its outer layers and collapsed into its present state as a white dwarf, about 120 million years ago. Its mass now is about the same as the Sun. ↑ 1.0 1.1 1.2 Liebert, J. et al. (2005). "The age and progenitor mass of Sirius B". The Astrophysical Journal 630 (1): L69–L72. doi:10.1086/462419. This page was last changed on 8 May 2018, at 05:22.